Like many of you, we have been watching the news about the wildfires in Fort McMurray, Alberta. The entire city of over 80,000 people has been evacuated. Whole neighbourhoods have been lost to the fire. People have lost everything. The images from the disaster are shocking and heartbreaking. And unfortunately, the fire is still spreading. It’s hard to know what to do to help. But as quilters, maybe the thing that we can contribute is to give back a bit of comfort, by making some quilts for these families and evacuees who have gone through so much. If you are in the Ottawa area, you can drop blocks off in person to Mad About Patchwork. Thank you so much for your generosity and help. We will post updates on this, as we get more information. If you have finished quilts that you would like to donate, you can get in touch with the Quilts for Fort McMurray group on Facebook. Or, check out the listing of places collecting quilts on Cheryl Arkison’s blog. You could also consider donating to the Canadian Red Cross, which is responding to this emergency. *This was mostly copied from slostudio.ca - Stacey was very kind to start blogging and instagramming this initiative, while we were working the OMQG room at the Common Thread Quilt Guild Show. Hi Ladies - the Saskatoon MQG is collecting blocks for your efforts. Can we assist further by sending a completed quilt top? Let us know either way! We have our meeting on June 26th and will do a final collection of blocks then and mail them to Mad About Patchwork that week. 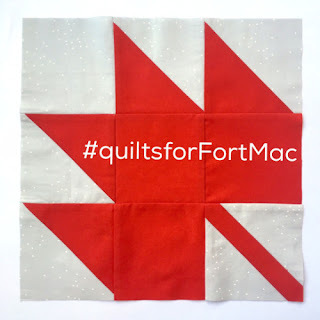 HI - the Saskatoon Modern Quilt Guild would like to send blocks for this cause. we have our June meeting on June 26th and will collect the final blocks then and send them to Mad About Patchwork then. Would you like us to send enough for complete top?